list your exhaust vid/sound clip and tell your setup and anything that would alter the sound of the exhaust that u have installed. Please no discussion here. This is just for posting videos and descriptions. Ok guys it seems like everyday we get people asking about exhaust. You asked for it so here it is. The following is intended to be an unbiased review of exhaust options for the 3.8L V6 mustang. If anyone has any questions that are not answered in this write up, please feel free to PM me and I will do my best to answer them. Now on to the write up. I want to start by saying the the PRIMARY gain that you will get from an upgraded exhaust is a better sound(so you should make your exhaust choice based on your preferences of exhaust sound). You can also enhance the look of you car. As far as power, don't expect a huge difference(although a tuner will help). I don't care what exhaust you get, you will see less than 20 HP gain from it. Also, remember that with many exhaust upgrades that you will lose some low end torque due to lose of back pressure. However, you will get all that power back plus a very little bit more higher up in your power band. Lets continue with the different parts of the exhaust system. 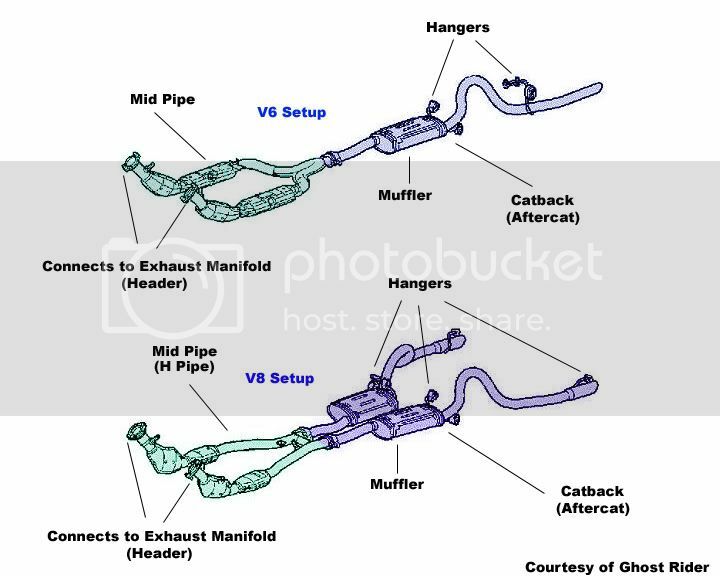 The system consists of Headers, Cats (catalytic converters:some setups don't have cats),Mid-pipe (some setups don't have a mid-pipe), Mufflers (you can go without them but I HIGHLY recommend against it), and Tips (or dumps or turn downs). You also have O2 sensors, but most of the time you'll keep the ones you have. I will get into each of these different parts in greater detail later. But for now lets review. Parts of Exhaust: Headers, Cats, Mid-pipe, Mufflers, Tips. Now lets go over the different types of exhaust that you can have on the V6. The first option is the stock exhaust. For this you don't have to do anything. It is a single exhaust with the stock cats and stock y-pipe going to the stock muffler and out the back through a single tip. A small step up from this would be to replace just the muffler. This will not help you out much, but you will notice a small improvement in the sound. Next you have the "fake dual" exhaust. This is a catback setup that bolts up to the stock y-pipe. With this setup you will have 2 mufflers and 2 tips coming out the back. But be warned THIS IS NOT TRUE DUAL!!!! It will not sound as good or give you as good a performance gain as a real true dual setup. The advantage is that it is a bit cheaper and also easier to install. It will also give you the look of a true dual exhaust. The next option is a true dual exhaust. There are MANY different types of true dual exhaust. This is probably the option that most of you are looking for. I will go into much more detail of the different true dual options later. But for now, here is a VERY BASIC overview. Option #1 you can have headers, going to a mid-pipe, going to 2 mufflers, going to 2 tips. Option #2 you can have headers, with no mid-pipe, going strait to 2 mufflers, going to 2 tips. With both of these option you can also do a side exhaust or a what's know as dumps. Side exhaust means that instead of the tips exiting from the back or the car, they come out the side just in front of the back wheels. Dumps means that instead of having tips come out the back, you have the exhaust come strait from the mufflers and exit under the car. I'll go into more about the true dual options once I have explained more about headers and mid-pipes. Oh, one other exhaust option is an open exhaust. I HIGHLY recommend AGAINST this for several reasons that I won't go into now. But just to so you know an open exhaust is one where there is nothing after the headers. So to review. Types of Exhaust : Stock, Fake-dual, True dual, and open. Next lets go into more detail about headers. The header are the tubes that connect directly to you car's engine. they are the first part of any exhaust system. The three basic types of headers are stock headers, shorty headers, and long tube headers (often called LTs). Stock headers are what come on your car. They work just fine, and can be used in a true dual setup. Shorty headers won't give you any performance or sound gain over stock headers. Usually, it is a better option to keep your stock headers than to get shorties(because it is cheaper and easier). However, shorty headers can be useful if you want to go FI (forced induction). The final option is Long tube headers or LTs. Lts will give you slightly more power and will dramatically increase the sound of your car. However, they are illegal in many states. There are several things to consider about long tubes. The first is that LTs don't have cats. this means that you may need MIL eliminators or your CEL will come on. Also, with LTs if you want a setup with a mid-pipe, then you will have to get a "shorty" mid-pipe. I will go into greater detail about mid-pipes later. So while LT's make you louder and improve performance, they are more expensive and can cause emissions issues. So to review Header Options : Stock headers, Shorty headers, Long tube or LT headers. Ok, now lets take a look at the different mid-pipe options. The mid-pipe is what (in most cases) connects to the headers. Since the V6 is an even firing engine, it does not require a mid-pipe(this setup is called strait through). However, many people choose the have a mid-pipe because it will change the quality of your exhaust sound fairly dramatically. It will also VERY SLIGHTLY help to equalize your exhaust pressure. The stock V6 exhaust comes with a y-pipe. As the name implies this is a y shaped pipe that connects to your headers and combines the exhaust flow from the 2 sides into one pipe. It is impossible to have a y-pipe in a true dual setup. The other mid-pipe options are an H-pipe or an X-pipe. Both of these connect to the headers and channel the exhaust flow into 2 separate pipes. The H-pipe tends to produce a lower full sounding growl. The X-pipe tends to create a more raspy sound. Both the h-pipe and x-pipe are available in off road or O/R versions. This means that they do not have cats. This is illegal in many places. However, a catless exhaust tends to be raspier and MUCH louder(so if that's what you're going for check your local laws). X and H pipes can also be found in "shorty" versions to go with long tube headers. These can sometimes be a bit hard to find and are almost always catless. So to review Mid-pipe Options : Y-pipe, H-pipe, X-pipe, Strait though. Alright, now lets talk about mufflers. This is probably the single most debated part of the exhaust. It will have one of the biggest effects on sound and performance, so this is a really important choice you'll have to make. The two main types of muffler are Chambered and glasspack. There is little to no debate out this. Almost EVERYONE will say choose a chambered muffler. The glasspack will greatly reduce back pressure, this will result in a noticeable lose of torque. In addition, glasspacks sound ricey as hell(sounds like a honda fart cannon) on a V6. The real debate is what kind of chambered muffler sounds the best on the 3.8L. I personally prefer the sound of flowmaster 40 mufflers. However, that is just my personal opinion. There are MANY MANY options out there, and it is up to you to decide which one you like the sound of best. I would suggest going on youtube or searching the forum for mustang V6 exhaust clips, this will give you some idea of what brand you like the best. Be aware however that exhaust clips NEVER do justice to the real thing. No matter what you choose you'll be amazed at how much better the real thing sounds than all the clips you heard. Just so that you know, here is a list of some of the more well known muffler brands (it is up to you to decide what you like best): Flowmaster, Mac, Magnaflow, Borla, Pypes, SLP, GT takeoff(the exhaust from a GT). Finally, there are just a few extra things that I'd like to bring up. Something that you're going want to consider is how you want the exhaust to exit. As mentioned you can dump your exhaust after the mufflers. This way, your exhaust will not be seen. You can have your exhaust come out of exhaust tips in the back(this is by far the most common option). If you choose this option you have several more choices to make. In the 94-98 GTs the pipes come out under the bumper. However, on the 99+ GTs the tips exit through cutouts in the bumper. If you have a 99+ you might want to swap you stock bumper out for a GT bumper, or you can have the pipes exit under the bumper like the 94-98 stangs do. If you really want there are body kit bumpers available for all 3.8L years. Another option is turn downs. The stock V6 has turn downs. This means that the pipes bend down toward the ground as they come under the bumper. The final option is a side exhaust. This is expensive and hard to do. In most cases you will want to get a body kit to allow for this type of exhaust. You will also want to consider if you want polished tips or not, as well as if you want slant cut or straight cut. This is all a matter of personal taste and will not effect the sound or power of the exhaust in any way. Another thing that you will want to consider is pipe diameter. If the diameter of your new pipes is too large you may lose too much back pressure, resulting in a lose of torque. The most common pipe sizes are 2.25" and 2.5". As a general rule anything over 3" is WAY TOO BIG. The last thing that you want to consider is how do you want to put together your exhaust. There are several option here as well. This will have a great effect on the overall cost of your exhaust. One option is to have an exhaust shop fab you up a custom exhaust with the mufflers of your choice. This is usually the cheapest and easiest option. However, if you take this option you need to make sure that whatever shop you choose uses mandrel bent pipes and not crush bent pipes. It can sometimes be VERY HARD to find a shop with a mandrel bender. In this case you have a few options. You can buy a headers if you want them, a mid-pipe, or get an adapter to convert your y-pipe into an h-pipe (Mustang Parts & Performance - American Muscle sells one). Then you can either get the exhaust from a GT of your model year (you can bolt that up as is, or replace the mufflers for mufflers of your choice), or you can buy a full catback exhaust kit from any of the manufactures I listed earlier. Depending on what options you choose, after install you can expect your exhaust to cost anywhere from $400-$650(more if you do body mods to go with it). So that concludes my exhaust write up. I hope that this has been helpful. As I said in the beginning, if you have any exhaust questions that you didn't find the answer to in this post, feel free to PM and I will help as best I can. Thanks. Last edited by WLJohnson05; March 9th, 2011 at 11:16 PM. Don't post unless your posting a clip of your exhaust. This isn't the best video. This is mac long tubes, no cats, divorced duals, flowmaster original 40s. Stock manifolds, stock cats, no mid pipe, original 40s. This is a before and after video...kind of good to show you the difference between true dual non chambered setup into an X pipe setup with a chambered muffler. you can click one of my links below to hear my setup from inside the car at speed. Thermal wrapped stock headers... might have added to the sound (I totally even forgot I did that so long ago).. the wrap is still there and looks like the day I put it on and siliconed it up. Xcal3... you'll think Im nuts but this was my last mod and I definately hear a sound difference beyond the higher rev and squeeling of the tires. It made the engine sound slightly deeper and gave it more "thump". Last edited by WLJohnson05; September 2nd, 2008 at 04:33 PM. Heres my Exhaust clips in and out side of the Stang. I have 40's cats back O/R H pipe Longtube Headers and CAI. Last edited by WLJohnson05; October 9th, 2008 at 01:04 PM. The ones who never shut their mouths, never learn anything in life. 2/5 inch piolt tips 2.25 pipes and stock with cold air TELL ME WHAT YOU GUYS THINK PLEASE! Last edited by 1999.35mustang; October 9th, 2008 at 12:52 PM. YouTube - 2004 Mustang flowmaster 40's pretty Loud! Last edited by N29468; October 18th, 2008 at 11:12 PM. Last edited by uconnV6; October 23rd, 2008 at 02:09 AM. now the second video shows that i am going to have to replace the mufflers soon i believe because they are making alot of noise on start up when its cold.